While bacon isn’t healthy and has received a bad rap in recent weeks, I’m a strong believer in ‘everything in moderation’. There is no harm in a little indulgence once in a while – it is Christmas after all! 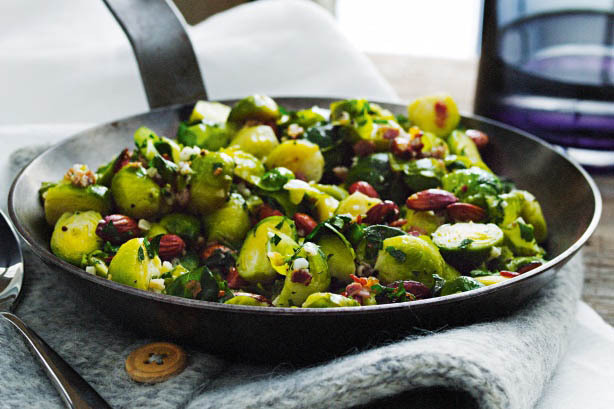 Brussel Sprouts are on the “either you love them or hate them list”. I love this recipe as I’ve turned the haters into lovers with one taste of this dish! Bacon and Brussel Sprouts go so well together. While I love the bacon in this recipe it makes a really great vegetarian dish without it, simply leave it out of the recipe below! Fry bacon in a frying pan over medium heat until it starts sizzling. Add Brussel Sprouts to the pan. Fry until they are seared brown on the outside and a little bit crispy and the bacon is almost done as well. Add in the walnuts and fry until they are toasted. Pour the honey over the top, stir until everything is coated and serve.